Let's get right to it....here are the performance numbers based on my very unique ultra high performance exhaust system installed last month! The peak gains with just the headers and exhaust installed (no other changes, not even tuning!) were 53RWHP and 49RWTQ and yes, this is with the CAT's removed, however, this is through a complete semi-quiet exhaust system with tailpipes out to the rear of the car!!! The other killer is that I was way rich on the dyno (~11.8-11.9 A/F at high RPM!) so there was more power to be had if I could have just leaned it up a bit! The before numbers were through 2-1/4” real dual exhaust with CAT’s and DynoMax mufflers (324/315 RWHP/RWTQ) compared to 377/364 RWHP/RWTQ (no other changes!) with complete street exhaust and I picked up another ~4.5HP with a ported throttle body by Shaner to end the Dyno session at 381/364 RWHP/RWTQ. For those that need the details! The baseline run that I made (run #14 on 5-4-02) was done the day before I took the car out of service to begin the exhaust work so that I would have a good baseline to measure performance from. Run #19 was the best run with the “exhaust only” change and run #21 was with the Shaner ported TB installed (the TB gained ~4.5HP more in peak power over and above the header only numbers). I tried changing the A/F in LS1_Edit PE tables (took out 15% fuel at WOT) but was only successful in pulling fuel out to 4600RPM for some reason. Originally it was all at ~11.8 to 11.9 A/F throughout the RPM band but the peak power numbers really didn’t change much. What’s really amazing is the overall gains by this combo…..between 3000-6000RPM the average torque gains were a staggering +47.6 RWTQ!!! The HP gains were just as astounding between the sweet spot of 4600-6500RPM (where my T56 six speed operates) where it averaged +48.3RWHP!!! Soooooo....I am very pleased knowing more power is still to be had when I get it leaned up a bit. The really cool thing is that my new 381/364 RWHP/RWTQ are through a complete semi-quiet street exhaust....NOT THROUGH A CUT-OUT!!!! I changed Dyno locations today and had to re-baseline my car. 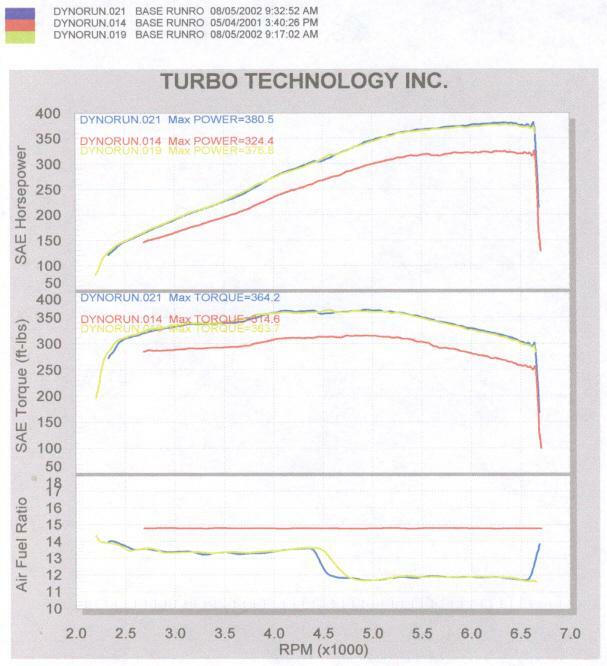 At Turbo Technology 1-1/2 weeks ago I made 381 RWHP & 364 RWTQ. 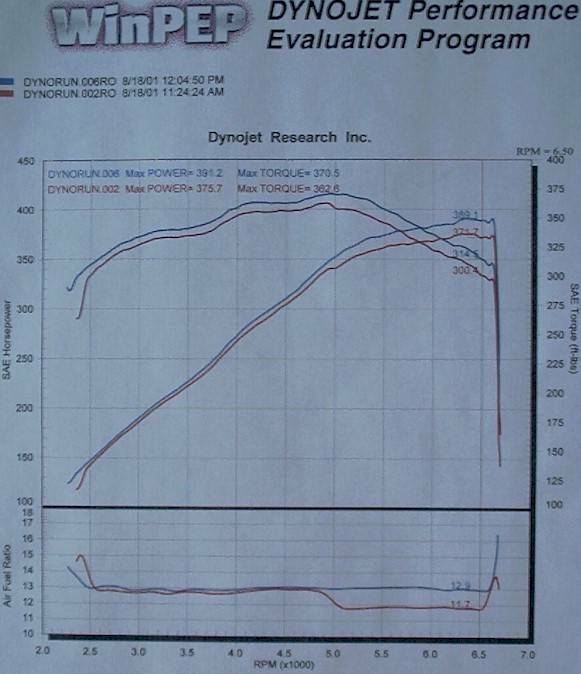 New baseline today (no changes, just a different Dyno) was 376 RWHP & 363 RWTQ.....about 1.3% difference (~5RWHP & 1RWTQ) but for all intent and purposes (based on different weather conditions and different dyno's) the same. What is really cool is that Steve Barker (his '67 Corvette with a 542 All aluminum Big Block makes 691 RWHP N/A on pump gas!!!) has this dyno in his personal garage at home!!! Special thanks go to Steve for letting me flog my car on it! Now the good news! I used the latest version 1.1 of LS1_Edit which enabled me to turn off the CAT Over Temp function to rid my over-rich condition at high RPM. This made the A/F very smooth at about 12.9:1 average vs. a low of 11.7 before as you can see below. This tweak alone added about 12RWHP!!! I know that I should have the A/F set with peak richness at peak torque and then lean out slightly at peak HP for best results but I didn't have time today to tweak it much more. I'll do this level of fine tuning when the fully ported heads go on. Bottom line, I also bumped my timing by 2.5° to 30° total (this alone added about 3HP at peak and unfortunately I had 1.8° Knock Retard at high RPM too) and between the CAT Over Temp switched off and the added timing I picked up +15.5 RWHP & +7.9 RWTQ today on the Dyno bringing my new totals to 391 RWHP & 371 RWTQ through full exhaust (less CATs) and stock heads. Sooooo, the final numbers for just the exhaust system & TB are +67 RWHP and +56 RWTQ with the help of LS1_Edit tuning. What really excites me is that I know my exhaust is oversized for stock heads so I'll be expecting big gains with the fully ported Stage 2 heads that go on next month! Sorry to make you wait yet another month but this will basically be my final motor performance mods (for now! ).